The Przewalski horse (Equus przewalski poliakov) is the last remaining wild species of horses. All other horses are either domesticated or descended from horses which were once domesticated. Until the mid-1990's the Przewalski was extinct in the wild, exterminated by hunters. Through efforts of the Przewalski Foundation in the Netherlands and breeding preserves in Askania Nova, Ukraine, in 1992 two combined breeding groups of Przewalski horses were reintroduced to Mongolia with the ultimate plan to reintroduce the animals to the open steppe. It was originally believed that the Przewalski horse was discovered by the Russian explorer Colonel Przewalski, for whom it is named, in 1881. 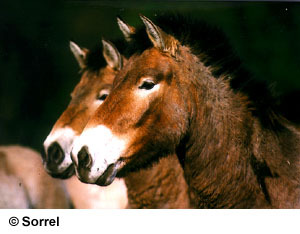 More recent information from the Przewalski Horse Foundation indicates two Europeans saw these animals much earlier. A Scottish doctor who was sent on an embassy to China by Peter the Great wrote of his experiences in Journey from St. Petersburg to Pekin, 1719 - 1723 and included an accurate description of this Asiatic Wild Horse. Even earlier, Hans Schiltberger, a Bavarian nobleman, was taken prisoner by the Turks and sold to the famous Tamerlane of the Golden Horde, who in turn gave Schiltberger to a Mongol prince named Egedi. Schiltberger spent several years in the Tien Shan mountains. He wrote of the wild horses he observed in his memoirs "Journey into Heathen Parts". The unpublished manuscript was written in 1427 and is housed in the Munich Stadtbibliotek (municipal library). 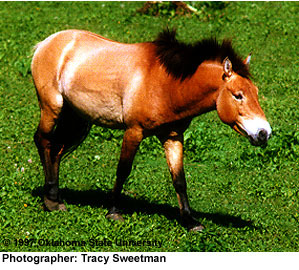 Some authorities feel strongly that the Przewalski horse is the ancestor of all modern breeds. Others point out that it is a different species from the domesticated horse, having 66 chromosomes as compared to the 64 of the domestic horse. They further point out that while crosses between the Przewalski and domestic horses result in a fertile hybrid, the offspring has 65 chromosomes. Subsequent crosses result in 64 chromosomes and bear little resemblance to the Przewalski. The Foundation for the preservation and protection of the Przewalski's Horse, in Rotterdam, the Netherlands, report that only a few Przewalski horses are tamable, in proportions similar to a Zebra. Group blood testing has found several marks which are unique to the Przewalski in addition to markers which it has in common with other equids. 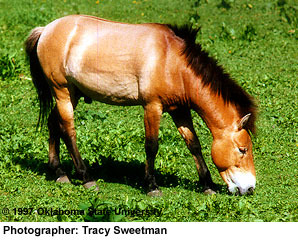 Przewalski's horse is similar to the domestic horse though it has a smaller, more robust build, and upright mane, and a low-set tail. The most common colors are sandy tan, dun, and reddish bay. The horses have a dorsal stripe, a shoulder stripe, barring in their legs, and lighter coloring on their muzzles and bellies. Concern about the future of the Przewalski horse led its breeders to form an international studbook in 1979 to facilitate the goals of increasing the population and reducing inbreeding. The species has also been included in the International Species Inventory System, a computer-based information system for wild animal species in captivity. There have been exchanges of breeding stock between North America and the former U.S.S.R., which now has the largest herd of Przewalski horses at Askania Nova in southern Russia. RARE. There are approximately 150 horses in North America, almost all held in zoos. American Livestock Breeds Notebook. The American Livestock Breeds Conservancy, Pittsboro, NC. Copyright 1989.